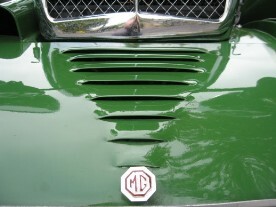 The octagonal front apron knobs are another example of a high quality CNC milled product made solely for Vintage MG Parts. 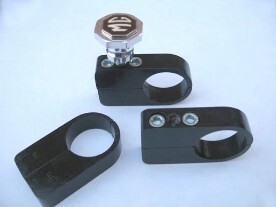 The clamps are made in-house and we have changed the design and machining processes. They incorporate blind holes (instead of straight through) to keep out the rain whereby we also use zinc plated bolts which we screw in from the top face instead of the underside. The badges are a faithful copy of the original Stratton badge and are in hard enamel. We also sell the J Type front apron.